Use MacroscopeJ to view and classify your images. 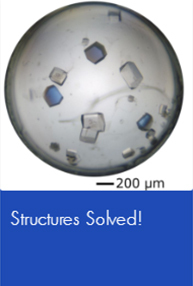 Identify any wells with crystals (“hits”). Review the cocktail-only image corresponding to each hit to make sure that the hit is not an artifact that was in the plate prior to the addition of protein. 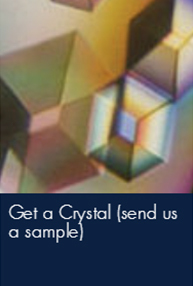 Positive (white) signal in the SHG images can be used to verify that the hits are crystalline. Not all crystals will have a positive SHG signal, but if signal is detected, then the object is most likely a crystal (Haupert LM, and Simpson GJ, Methods, (2011), 55, 379-386). Positive (white) signal in the UV-TPEF images can be used to verify that the hits are protein if tryptophan residues are in the sample. 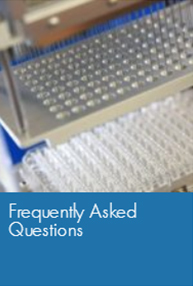 Not all proteins, or protein/cocktail combinations, will produce a positive UV-TPEF signal. The object does not have to be a crystal to have a positive UV-TPEF signal (Madden JT, DeWalt EL, and Simpson GJ, Acta. Cryst. D (2011) 67, 839-846). Select hits to reproduce or optimize. Reproduce any hits that you wish to verify. (A protocol is available here). If you have good hits, take the initial conditions identified by screening and attempt to optimize them by varying the concentration of the macromolecule and precipitant as well as the growth temperature in a systematic manner (Luft JR, Wolfley JR, Said MI, Nagel RM, Lauricella AM, Smith JL, Thayer MH, Veatch CK, Snell EH, Malkowski MG, and Detitta GT., Protein Science (2007), 16, 715-722). MacroscopeJ Image data can be conveniently viewed with corresponding chemical information using the program MacroScopeJ. The software is java-based to be compatible with most operating systems. CheckShow CheckShow is a multi-platform program written in Java that displays a virtual 1536-well plate annotated by well position or cocktail number with color-coded experiment outcomes. This software is useful for identifying well locations on a 1536 well plate for crystal extraction, or other testing purposes. 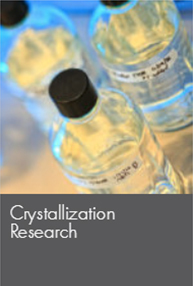 CrossPlate CrossPlate is Java-based software designed for the analysis of parallel crystallization experiments to test the effects of distinct variables on the outcomes. 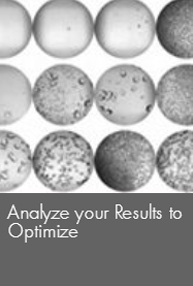 Examples include studying differences between the crystallization outcomes of control experiments, examining different protein formulations, the comparison of multiple constructs and of complexes versus individual components. SlickSpot SlickSpot.xls is an interactive EXCEL spreadsheet that allows investigators to formulate grid screens near a given phase boundary for a particular detergent as discussed in Koszelak-Rosenblum M, Krol A, Mozumdar N, Wunsch K, Ferin A, Cook E, Veatch CK, Nagel R, Luft JR, Detitta GT, Malkowski MG. (2009) Determination and application of empirically derived detergent phase boundaries to effectively crystallize membrane proteins, Protein Sci. 18, 1828-1839.